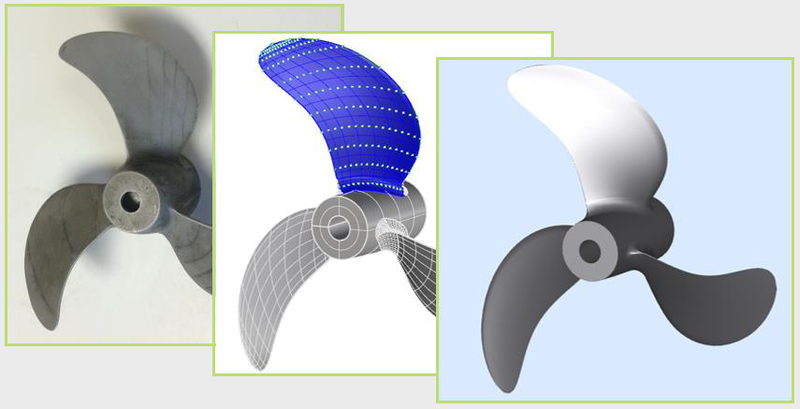 PropCad is being used to interpret existing propellers, patterns, and scan reports in order to recreate legacy designs. The Scan Converter utility allows users to convert 3D inspection data (X-Y-Z or X-R-θ) into a PropCad design, 2D drawing, and reports! HydroComp’s Scan Converter utility, which is now a part of PropCad Premium, is used to extract propeller parameters such as pitch, chord, skew, rake, and thickness using 3D data points collected from a physical propeller. Scan Converter processes the data and recreates the propeller blade by extracting individual sections from the geometry and deriving the geometric distributions. Once the design is in PropCad, additional documentation such as 2D drawings, pitch inspection reports, and 3D offsets can be easily generated for customers, clients, and record keeping. These 3D data points can be in Cartesian (X-Y-Z) or Polar (X-R-θ) formats. The data can be sampled on both the face and back of the blade, or just the face with a corresponding thickness measurement.